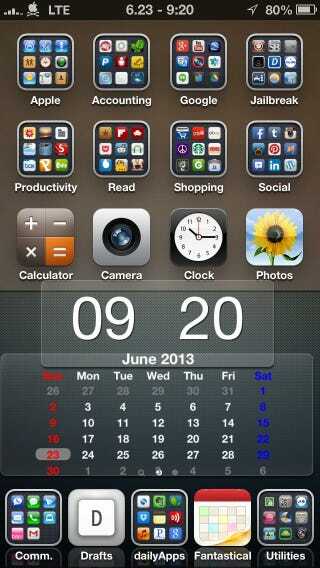 Tip: iPhone Home Screen Organization. If you are like me and have tons of apps that have accumulated on your iPhone and are clogging up your home screen(s), then this tip might be for you! I have used numerous approaches to app organization and I feel like my current iteration is the most helpful that I've tried. The basic concept behind my layout is where the notification badges appear. I was overwhelmed with all the different badges all over the place ranging from email, text, phone calls and social media notifications. Now, I understand that you can just turn them off individually but I like to have a visual representation of my notifications and the badges are good at that. I seemed to be stuck between a rock and a hard place. So I threw all the apps that have directly to do with communication in a folder on my dock called (Comm.) for communications. I also have done this for daily used apps and utilities. I also threw in a shot of my second home screen just to show what I like to use. I've found that I like to use widgets through Dashboard X from Cydia but I often don't use them. This is my current page of widgets that I am trying out. Let me know what you think and maybe even show some of your homescreen organizational preferences.